Virginia trips tend to produce long stretches of distance between good coffee stops. 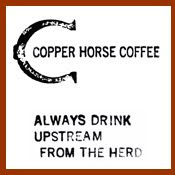 Many years ago, before I really got into coffee, I remember going the whole stretch of Interstate 81 through Virginia without one drop of coffee. Ever since, I've tried to make the gaps between coffee places (especially on such huge states as Virginia) a little smaller. One surprising find was in the city of Fredericksburg, a place called Hyperion Espresso. The area has a lot of history and I had to go right through it on a small road trip, so the prospect of good coffee seemed too good to be true. Strapped with hope, I careened into Fredericksburg looking for lunch and good coffee. I decided upon Castiglia's for a good meal and than made my way to the large red awning of Hyperion. Along the large paned windows sat a couple metal tables and wood benches with several patrons merrily drinking their coffee. The merriment extended inside to Hyperion's two-level cafe; the top portion mostly seating and the bottom, an oval-shaped room with a non-functioning balcony around the perimeter and a hopping counter. The coffee comes from Batdorf and Bronson, a skilled roaster out of Atlanta and Olympia. 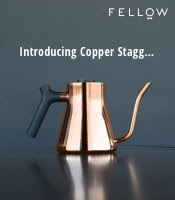 I had their Costa Rican that fine afternoon, a coffee with a little bit of a wheaty taste, hints of pear and croissant as well as a small flare of a spicy jalepeno on the end. The espresso, pulled fairly well, was sweet and bright, with touches of caramel and choc milk and a bit of blood orange on the front. The espresso did seem a little dark but overall both the drip and the espresso were good. The tea I failed to note. Having found joy in another good coffee find, the road between Washington DC and Richmond seems much more enticing. 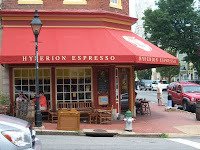 Whether Fredericksburg is a destination (good stuff to see by the way) or a detour, give Hyperion Espresso a stop. Well, looks like you've found me a new place to stop for a couple of shots on my trips down to Atlanta. Its true, great coffee shops are hard to find on the road, so the more info available on where to stop the better!